When you need to keep things moving, rely on Cenex® lubricants and your cooperative Viafield. We've got products for all types of applications - from heavy-duty trucks to hard-working tractors. Our family of advanced products spans the full range of technologies, including conventional lubricant fluids, full and partial synthetics, and bio lubes made with vegetable oil. Proven Cenex lubricants are manufactured with the finest lube oil base stocks and specially blended additives. Our lubricant product categories include engine oil, tractor fluid, grease, hydraulic oil, transmission fluid, gear oil, two-cycle engine oil, four-stroke lawn/garden and recreational engine oil, industrial lubricants and other specialty categories. To learn more, check out the products below, or contact your refined fuel sales specialist today. Maxtron Envir-Edge 5W-40 is our most advanced full synthetic diesel engine oil. It is engineered for fuel economy and wide temperature range performance. CLICK HERE for data sheet on the Maxtron Enviro-Edge lubricant. Superlub TMS contains a new formulation engineered for 2007 model year and newer diesel engines with advance emission control systems. 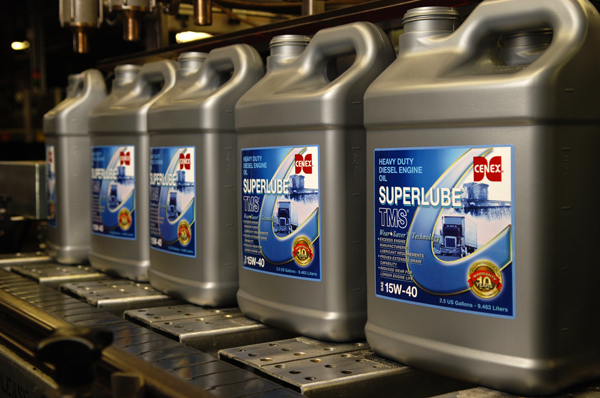 CLICK HERE for the data sheet on the Superlube TMS lubricant. Qwiklift HTB is a multifunctional universal tractor hydraulic fluid formulated specifically for agriculture and construction equipment using a common sump. CLICK HERE for the data sheet on Qwiklift HTB lubricant. Poly-Xtreme is advanced technology poly-urea based grease. Poly-Xtreme is compatible with other poly-urea grease enabling its use in many applications. CLICK HERE for the data sheet on Poly-Extreme grease. Blue Gard 500+ is a premium heavy-duty, multipurpose grease recommended for automotive, industrial, and farm use. CLICK HERE for the data sheet on Blue Gard 500+ grease.